Thanks for posting this. 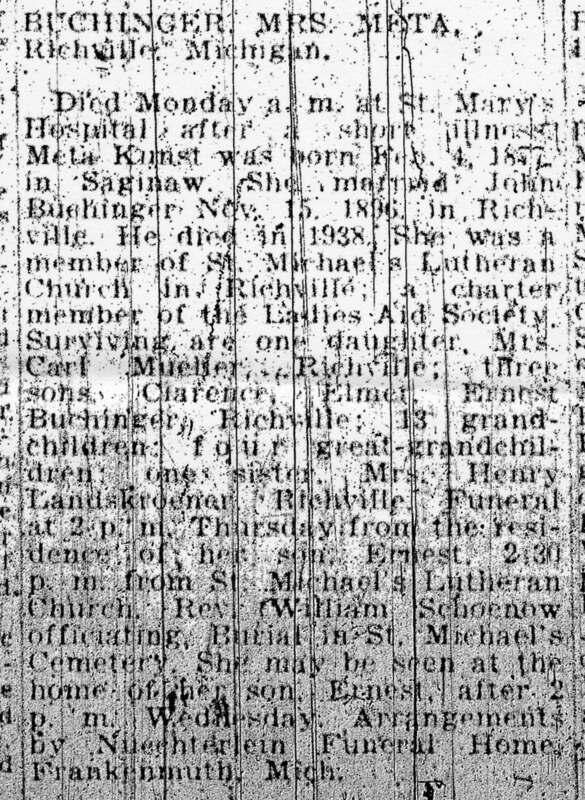 My father, Larry Buchinger, was adopted by Raymond & Laura Buchinger of Richville, MI, in the 1940’s. They had a small grocery store in Richville. I’d love to find pictures of it. He grew up in that tiny town, but joined the navy right out of highschool. There are still Buchingers living in that area. I believe Clarence Buchinger is/was a cousin of my dad’s. 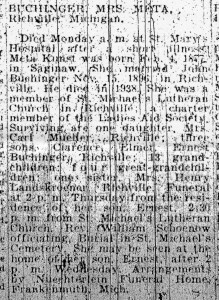 My dad passed away in 2003.
http://www.jessicagreen.com/wordpress/2012/04/22/sundays-obituary-meta-kunst-buchinger/You must be logged in to post a comment.